President John F. Kennedy delivers his inaugural address. Fifty years ago today, John F. Kennedy, the Democratic senator from Massachusetts who won the White House by the smallest popular-vote margin in history, was inaugurated as the 35th president of the United States. As Todd S. Purdum writes in Vanity Fair this month, the day sent a “tidal wave of glamour, promise, and high spirits” across Washington and the nation. No inauguration, before or since, could be argued to be as glamorous or filled with optimism as Kennedy’s. The John F. Kennedy Presidential Library and Museum has assembled a terrific website that gathers together materials related to the dawn of the Thousand Days. And, to boot, they’ve digitized the bulk of their Kennedy Administration archive. 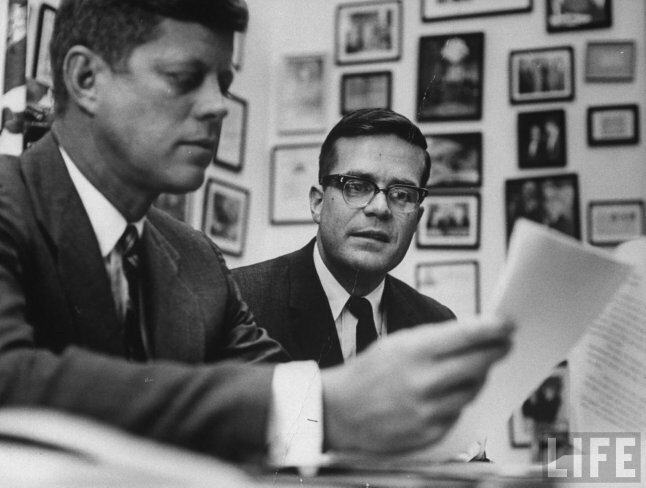 President-elect John F. Kennedy reviews documents with his aide and speechwriter, Theodore C. Sorensen, in Decmber 1960. This photo was taken by Paul Schutzer is presented courtesy of the LIFE magazine photo archive. Theodore C. Sorensen, speechwriter to President John F. Kennedy and author of the most memorable words in 20th-century American politics, died Sunday in Manhattan. He was 82 and had been suffering complications from a stroke he endured a week ago. Born in 1928 in Lincoln, Neb., Sorensen first went to work for then Sen. Kennedy in 1953 after having earned undergraduate and law degrees from the University of Nebraska. He went on to play a critical role in drafting sections of Kennedy’s much-praised “Profiles in Courage,” published in 1956. That book proved a stepping-stone toward a four-year march toward the White House. After the assasination, Sorensen practiced law and remained active in Democratic politics. He authored a 783-page memoir of the administration that was titled, simply, “Kennedy.” In 1976, he declined an offer from President Carter to lead the Central Intelligence Agency. He was an earlier supporter of President Obama’s and had recently expressed worries over the current administration’s handling of the war in Afghanistan. 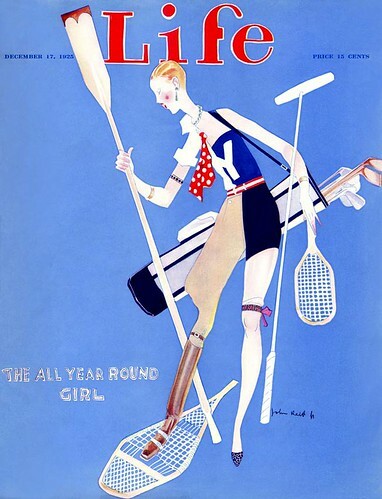 The cover of the Dec. 17, 1925 number of Life is graced with a John Held Jr. illustration of an athletic flapper. I first became aware of the illustrative genius of John Held Jr. while researching a paper on “The Great Gatsby” in 1995 or 1996. His images of twiggy, angular young women gave life to the image of the Flapper, those charming, hard-drinking, hard-smoking and liberated women of the glorious Jazz Age. Born Jan. 10, 1889 in Salt Lake City Utah, Held sold his first illustration to Life at age 15. At 16, he joined the staff of the Salt Lake Tribune as a sports cartoonist and by 1912, he had come east to the capital of American culture, New York. After the interruption of World War I, Held began successfully placing his work in a range of magazines, but his covers for Life, depicting the glories, foibles and evolving mores of the decade. Held’s subjects drink, they smoke, they play sports, drive cars and generally carouse. Simply put, they are icons of 20th-century illustration and graphic design. When not drawing illustrations, Held occupied himself with woodcuts, creating cartoons for The New Yorker, which was edited by Harold Ross, an old pal from Salt Lake City. After the crash, Held returned to newspaper work. Two strips, “Margie” and “Rah Rah Rosalie” had brief broadsheet runs in the early 1930s. Though his work is identified almost exclusively with the 1920s, he continued to work as an illustrator until his death in 1958. 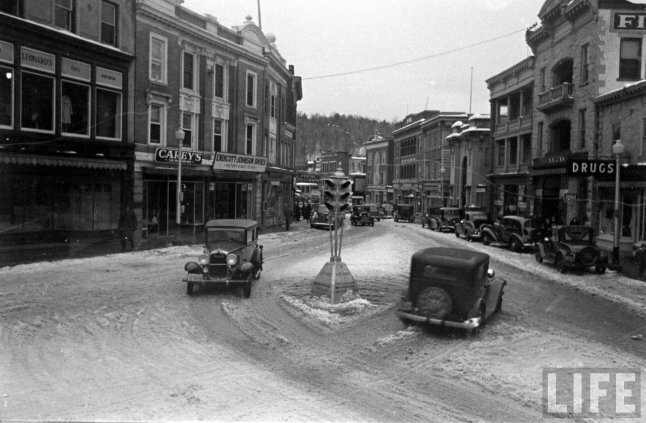 Looking southeast on Saranac Lake’s Main Street toward the Harrietstown Town Hall, 1937. This view looks nearly identical today. Though I tend to write quite a lot about Lake Placid, I also harbor a deep affection for its neighbor, Saranac Lake, the Little City of the Adirondacks. First settled by the Moody family, who came west from Keene, New Hampshire in 1819, the Saranac Lake we know today largely grew up around the Adirondack Cottage Sanitarium, a cure center for consumptives founded by Dr. Edward Livingston Trudeau in 1884. Spending long periods of time outside, even in the coldest hours of winter, was Trudeau’s chief prescription for those seeking to cure. 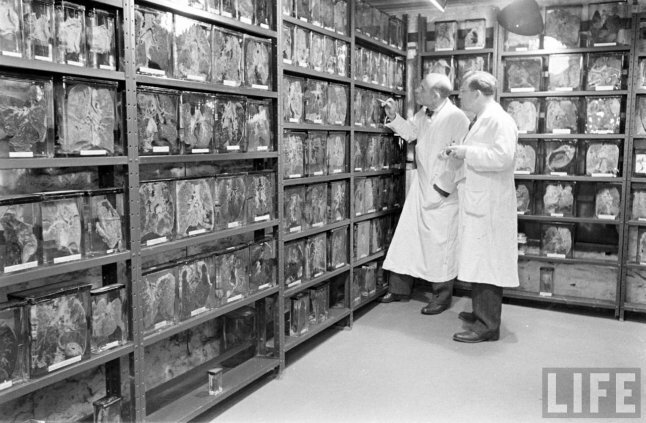 Trudeau doctors inspect tubercular lungs, 1937. The hospital’s beginnings were modest. “Little Red,” the cottage that housed the first two patients, two sisters from New York, is preserved on the grounds of the Trudeau Institute. But Trudeau’s practice, and the village with it, grew quickly. Robert Louis Stevenson was a patient in 1887. By 1915, when Trudeau died, the San was a sprawling campus that included a number of cure cottages, a post office, a chapel dining facilities and so on. Other sanatoriums were constructed in neighboring Ray Brook and Gabriels, and the Will Rogers Hospital was built in Saranac Lake in 1927. But demand for the cure was such that hundreds of private “cure cottages” opened across Saranac Lake. The village’s entire economy centered around its position as a health resort. For more on the history of the Little City, visit Historic Saranac Lake. 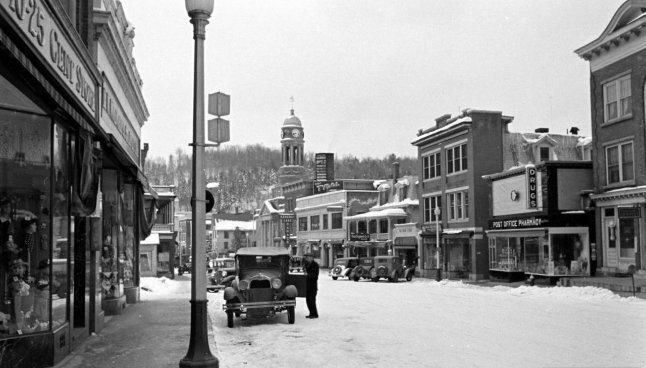 Here, though, is Saranac Lake in 1937. These photos, from the Life Archive, were shot by the prolific Alfred Eisenstaedt for a story that was published in the magazine’s Nov. 29, 1937 issue. Titled “Tuberculosis: A Menace and a Mystery,” the piece explored the treatment of the disease in Saranac Lake. A number of Saranac Lake icons are here: There are shots of a WNBZ broadcast, a woman sitting a recliner no doubt from Fortune’s reading the Enterprise, Little Red, the Harrietstown Town Hall and the Hotel Saranac, Berkeley Square and so on. Andrew Weibrecht, Lake Placid’s own, is on the cover of this week’s issue of Sports Illustrated with U.S. Ski Team colleagues Lindsey Vonn, Bode Miller and Julia Mancuso. Image courtesy of Sports Illustrated. Andrew Weibrecht, the “War Horse” wunderkind of the U.S. Ski Team, figures prominently on the cover of the March 1 issue of Sports Illustrated. With him are silver-and-gold medalist Lindsey Vonn, Bode Miller, whose Vancouver hardware collection includes all three medal varieties, and silver medalist Julia Mancuso. The four are the focus of “American Flyers,” a feature by Tim Layden. Congratulations, again, to Andrew, for earing a bronze in the Super G last week in Whistler. Good morning. It’s been ages since I put together a briefing, and I’m trying to get back in the habit. • Mario Pulice, creative director at Little, Brown, has lent the contents of his apartment — largely furnished with relics from the French Line’s piece de resistance, the Normandie, to the South Street Seaport museum. The furnishings, including a piano and chairs that were part of the legendary liner’s celebrated Art Deco interiors, will be part of a forthcoming exhibit, Decodence. The Normandie entered service in 1935 and was a favorite of Hollywood types and the Kennedy Clan. She met an early end in 1942, when she capsized at Pier 88. The Times reports. • The Pegu Club, epicenter of craft cocktail subculture in New York, was cited Jan. 19 for violating city health codes, the Times reports. In serving an Earl Gray MarTEAni without informing a customer that the cocktail contained egg white, which might have contained salmonella, the gin joint earned a citation from a city Health Department citation. Audrey Saunders, the luminary who owns the place, immediately stopped serving the drink. Read on in the Times. • Bruce McCall, the humorist and artist, eviscerates today’s Type A parents in a wonderful little essay in this week’s New Yorker. • If you haven’t yet seen it, you must explore New York Magazine’s hilarious dissection of the the Urban Woodsman. The bearded, buffalo-plaid wearing hipster is now an urban tribe, the magazine has decided. • The Lancaster, Penn., Intelligencer Journal-Lancaster New Era, the Fayetteville, N.C. Observer and the Global Post will soon launch pay walls provided by Press+. The system comes from Journalism Online, a venture started by Steven Brill, the entrepreneur behind Court TV and other projects, and his partners. The Times reports. Take a look at some screenshots. • Andrew Sullivan, writing in the Atlantic, reviews of the disturbing results of a recent Kos poll of today’s Republican party. “Marinating in paranoia,” as Sullivan writes, a majority the Party of Lincoln’s followers believe homosexuals should not be allowed to teach in our schools, that Sarah Palin is more qualified for the presidency than Barack Obama and that the president is a socialist and a racist. Heaven help us. Good morning. It’s been ages since I’ve put together a briefing. Here’s the first of 2010. • The Project for Excellence in Journalism, a nonpartisan effort funded by the Pew Research, has found that a majority of fresh reporting comes from traditional media: newspapers, radio and television. The bulk, not surprisingly, comes from newspapers. Surveying 53 media outlets in Baltimore over three days and following six key stories for a week, PEJ found that old media far outpaces new media in terms of actually creating new content and breaking news. On the other hand, the study found that the Baltimore Sun created 72 percent less news in the first 11 months of 2009 when compared to the same period in 1991. The LAT reports. • Michael Kinsley, the veteran pundit who’s worked just about everywhere, arrives at the Atlantic this month. In his inaugural column for the venerable journal, Kinsley posits that newspaper stories are too long, encrusted with language that does little to convey the news. Read on. • Tucker Carlson, whose Daily Caller launches today, insists the site won’t be a shill center for the right wing. The Washington Post’s Howard Kurtz reports . • David Frum, writing in this month’s Atlantic, wonders if the Mugwumps, those terribly-monikered Republican reformers of the late 19th century, have more than a thing or two to teach today’s rabid conservative movement. Frum tires of the culture wars and believes the conservative movement in this country should, like the Mugwumps did 125 years ago, return to a set of politics based in reality. Frum’s piece is part of a wonderful series that assesses the first year of the Obama presidency by looking at American history. • In an excerpt from their new book, “Game Change,” in this week’s New York, John Heileman and Mark Halperin report that in John Edwards’ 2008 campaign for the presidency, nothing was too crazy to be true. • As has been reported widely for the past few days, Sen. Kirsten Gillibrand may face a primary challenge from former Rep. Harold Ford, who moved to New York after the 2006 election cycle. Gillibrand is preparing for that challenge. The Times reports. • Woody Allen is priceless in this week’s Shouts and Murmurs in The New Yorker. • I’m just starting to dig into Lisa Robinson’s “Oral History of Disco,” published in February’s Vanity Fair. Robinson talks with Gloria Gaynor, Donna Summer and other stars of the era to assess its lasting impact on our culture. • Cocktial aficionado and Atlantic contributing editor Wayne Curtis reports that a small-cocktail revolution is under way in this country, largely in response to Gulliver-sized behemoths of booze. • Pete Hamill, the old newspaperman and historically-concerned writer, is concerned for the safety of newspapers’ archives and morgues as the fate of the industry becomes ever more uncertain. In an interview with the Syracuse Post-Standard, Hamill talks about his new fiction project, his life growing up in Brooklyn and the future of newspapers. • Michael Hirschorn, writing in this week’s special issue of New York that looks back at the decade that concludes later this month, concludes that these last 10 years have been complicated by the increasing dichotomy between fact- and faith-based perceptions of reality. In addition, Hirschorn says, the Internet has solidified the culture of hustlerism, in which we’ve all got to relentlessly compete for attention, jobs and money. It’s good stuff, as is the rest of the issue, which does a predictably good job at looking over the Aughts. • Clarence Petty, icon of the Adirondacks, who died last week at 104, was given an obituary in Sunday’s Times. • Howard Kurtz of The Washington Post profiles New York editor Adam Moss and, in turn, the dynamo that is his charge. • And Vanity Fair offers an excerpt from the late Dominick Dunne’s final novel. Lewis Lapham, former editor of Harper’s, now runs a quarterly journal. 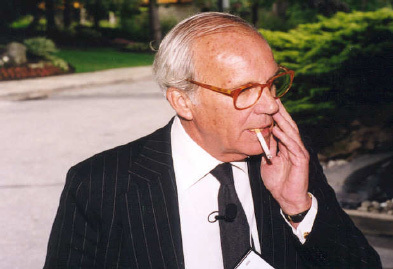 • Lewis Lapham, the dapper, chain-smoking and aristocratic wit who steered Harper’s from 1976 until 2006, is having a good deal of success with his new venture, Lapham’s Quarterly, the Times reports. You’ll hopefully get a kick out of his CIA anecdote. • Sarah Henderson, daughter of Fritz Henderson, the GM CEO who stepped down yesterday, flew off the handle about her father’s replacement in a Facebook post. New York reports. • The rise in the Canadian dollar has meant good news for Canada’s remaining N.H.L. franchises: the Montreal Canadiens, the Ottawa Senators, the Toronto Maple Leafs, the Edmonton Oilers, the Calgary Flames and the Vancouver Canucks. The Times reports. • In the cocktail world, there seems to be a quiet rum revolution. Trends like house-made bitters, 1890s-style armbands and over-reliance on gin are being swept aside out in California, where returns to Tiki traditions and rum are under way. The Times reports. • Gannett, the largest newspaper company in the country, has announced 26 layoffs at its flagship, USA Today. In addition, the U.S. Community Publishing group, which oversees the chain’s domestic newspapers, can look forward to furloughs in the first quarter of 2010. The Associated Press reports. • The Federal Trade Commission is weighing how, if at all, it might support struggling media companies, the Wall Street Journal reports. Rupert Murdoch, chieftain of NewsCorp and publisher of the Wall Street Journal and the New York Post, rejected the idea that good journalism be subsidized and publicly called aggregators, like the Huffington Post, thieves(!). In other Rupe news, the big man is planning a $15 million budget to launch a New York-aimed edition of the Journal this spring. The Observer’s John Koblin reports. Good afternoon. It’s an abbreviated work week. Be happy. • Zach van Schouwen, a Seattle-based Web designer, is the creator of The Block, an animated history of Eldridge Street between Rivington and Stanton streets. It’s a terrific look at the evolution of a city block that was once part of James Delancey’s farm. van Schouwen details the history of every building that’s ever been built on the street, starting with modest Federal-style houses and ending with the public housing project built on the block in 1985. Check it out. • Some students at Bowdoin have decided that there’s a lot of style in Brunswick and, inspired by The Sartorialist, they’ve decided to document it. Bowdoin Style is a neat little piece of Web real estate that could and should be copied by the Canton crowd. Such a project would be a great opportunity for The Hill News. • Executed Today, which I happened across last week, charts the history of capital punishment. Each day, the blog examines a historical execution and the story behind it. As a Canadian studies major, I was entertained by the recent mention of Louis Riel. • Autocompleteme.com made me laugh, and therefore, it should make you laugh too. • Turkey shooting has arrived, or more likely returned, on Long Island. The five-day season started there on Saturday, the Times reports, but the initial harvest was unimpressive. • Dave Lamoureux, a Cape Cod fisherman, catches massive bluefins from his kayak, the fortitude. That is simply awesome. The Times reports. • I enjoyed “Night Walk,” a piece of political fiction by Adam Haslett that appears in this week’s New York in which the president enjoys a well-earned cigarette, makes a critical decision about Afghanistan and reconnects with life outside the White House bubble. Haslett’s 2002 collection of short stories, “You Are Not a Stranger Here,” was a finalist for the 2002 National Book Award and the 2003 Pulitzer Prize. His first novel is due next year. The piece is one of seven in this week’s magazine that fictionalizes the lives of contemporary political figures. • Gawker’s Foster Kamer fires back at Stephanie Marsh, author of an essay titled “New York has lost its edge,” that ran in the London Sunday Times, with delight. • A change in Audit Bureau of Circulation rules that allows some newspapers to count folks who subscribe to both print and Web products as readers, the AP reports. This may cloud the realities of circulation decline.